Tasks, Schedules, Contacts, Lead Sources, Mailing List, Notes, Reminders - the easy way to manage them all ! Business contacts manager by categories in password-protected database. Database password security option to protect your information from instrusion, curious eyes and unwanted guests. With security options set on, only you can have access to information in your database. Sound and pop-up reminders to remind you about your contacts' important dates (birthdays, anniversaries, family day etc) you have earlier saved in the database, but might have forgotten about. Mailing list organize with Built-in bulk e-mailer you can use to send a single message attachment to all or selected group(s) among your contacts with ONE click of the button. Computer Programs for managing your tasks, contacts database, mailing list. All you need to know! 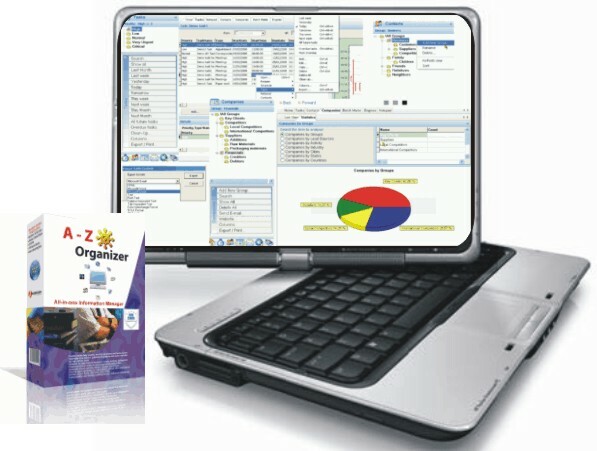 Business Kit (formerly A-Z Organizer) is a 6-in-1, multi-functional software you can use to manage your business information database, plan your daily, weekly, monthly tasks, schedules and appointments, manage contacts database, categorize business contacts/companies into groups and analyze them by key factors, streamline advertisement budget by trade leads, carry out e-mail marketing campaign with minimal cost and also keep intact many other miscellaneous info. Because it has been developed to cater for the most vital needs of Small and Medium businesses, Business Kit combines many features of advanced PIM and miniCRM, but is far less bulky, simple to use and far less expensive than a typical CRM computer program - ideal solution for small and medium businesses. Save your time and get organized: never will you forget appointments, meetings, correspondence and many other assignments. You can now plan ahead: daily, weekly, monthly or years to come. Just enter and save the details into the database. At the appropriate date-time Business Kit's built-in alarm will remind you of up-coming tasks. Vivid and colorful date-time-task graphs: make it easy for you to grasps what tasks are slated for when. At a glance you know your schedules for a particular day, week or month. Just click on the calendar and watch the scheduler and graph display information by date and time. Priotize your assignments: group tasks by factors and mark them with colors (high, low, normal, ver urgent, critical), making them easy to differentiate. For example, high-priority tasks - green, today tasks - red, for overdue tasks - grey etc. In addtion, for high priority tasks, you can set reminder to remind you minutes or hours before the actual time. Save time and nerves finding what tasks are slated for when: Filter tasks by date-time interval: last month, last week, yesterday, today, tommorrow, next week, next month, overdue tasks etc. Task manger powerful filter selects exactly the necessary tasks, even if they numbered thousands. Task manager is printer friendly: You can print out the colorful task graph or tasks list for a specified period, making it a handy reference in situations when you are away from your computer and keyboard. Contacts Manager is one of the core features of A-Z Business Kit. Be it personal or business contacts, you can create unlimited categories, groups and lookup fields to store your contacts information. Multiple telephone and multiple e-mail entries are also supported. That's not all. You can use your contacts data to automatically generate mailing list and send bulk emails with/without attachments. Personal Contacts: For personal contacts you can create unlimited number of category groups (family, school mates, friends, relatives etc.) for your contacts data entries in the [Contacts Section]. Typical personal contact data entry may include, but not limited to: names, birthdays and anniversaries, occupation, job description, location, telephones, emails etc. Business Contacts: If your contacts are business entities then, in a separate section [Companies], you can also categorize them into groups (suppliers, competitors, partners, clients, officials, creditors, debtors, key accounts, prestigious accounts, prospects etc). Full information may include, but not limited to: name, location, region, telephones, emails, area of business, activities, banker, decision makers, rating in the market, source of information (leads) etc. Contacts Linker:If required, you can automatically link (affiliate) your business contacts to companies in the database, so you can know at a glance which contacts work in what company, set reminder for important dates and events such as company anniversary. analyze leads sources and see which advertisements are bringing you prospects/profit, what marketing initiatives are cost effective and which ones are only draining your purse. Another key feature of Business Kit is advanced built-in bulk e-mailer you can use to send personalized message with attachment to tens/thousands or selected group(s) among your contacts with only one click of the button, saving you time and communication expenses - economical way to Advertise, reach clients or friends fast. Sales and/or marketing campaigns, price updates to your business contacts, new year or birthday greetings with cards to friends and relatives are good examples. Message Compiler: Compile email messages once, save them in the message archive and use them as many times as possible in future, saving you the headache of repeating the job. Business Kit stores all your e-mail messages, file attachments as correspondence in the database for future use and references. Send personalized messages: By default, each e-mail message is personalized, automatically stamped and sent with greeting, salutation, first and last names of the recipient, date and time, therefore can never be rejected as spam by your mail server, nor can you ever be accused of sending spam. Send message with attachments: For your email marketing campaign or personal purposes, you can send bulk emails as simple text, html, rich text with all common attachments including, but not limited to : html, word, excel, image files, video files etc. Mail receipt confirmation option: With mail receipt confirmation option set on, you will be able to receive and monitor feedback from recipients of your emails, so you are certain you have not labored in vain. Business Kit comes with rich text format Notepad that helps you keep miscellaneous information tidy and separate in easy-to-manage folders. For information that does not fall under key sections such as [Tasks], [Contacts] or [Companies]. No sticky notes! :No sticky notes or lost information. Keep things tidy! Categorize less important information: You can create unlimited category folders and store information such as your hobbies, sports, holidays, leisure, shopping, recipes, to-do-list, important tasks, books and their authors, films, software licenses, political events etc. Store information with reminders: Event notes such as sports, holidays, leisure, anniversaries, political schedules etc. can also be linked to Business Kit's built-in reiminders, so Nothing is forgotten, nothing is missed. Business Kit is equipped with advanced data import utility that supports direct import of contacts data from Microsoft Outlook Address Book, Microsoft Outlook Express Address Book, Windows Address Book (WAB), and also from any database and spreadsheet program including Microsoft Excel, Access, Open Office tables. If you have your contacts data stored somewhere else, you do not need to repeat the tedious job of manually filling contact info into the Business Kit's database from scratch. With only a click of the button, you can now import your business/personal contacts info into Business Kit's database from external sources. Full contacts data - name, telephones, fax, emails, website, city, state, country, company name, department, job title and even birthday for each of your contacts - will be copied from external sources and imported into the database. Business Kit's Audio and pop-up alert system keeps in memory important events and dates and will remind you early enough to take necessary action: be it your contact birthdays, family day, national or religious holidays, company anniversaries, high-priority tasks, important notes, etc. Nothing is forgotten, nothing is missed. Searching the database for information had never been so easy! All possible combinations of search criteria : equal to, greater than, less than, between etc. Business Kit enables you to export records from your database directly to your office programs for further manipulation or save the records into files of various formats such as: Word, Excel, Plain Text, Rich Text, HTML, Comma-separated Text, Tab-separated Text, Data Interchange Format, SYLK Format. Easier and faster than scraps of paper or Excel or Word. Keep information in secure, password-protected database. Work off-line. No Internet connection required. No monthly fees. Import contacts info directly from your email programs, spreadsheets etc. Save time and nerves. Manage contact and miscellaneous information more effectively by groups, categories, with auto reminder for important dates, anniversaries etc. No special knowledge or expertise is required. No additional drivers or third-party application to install. Everything has been simplified for the average user. Can be used by individuals, small and medium businesses to manage personal or business contact information. Use for any number of users, from 1 to 1000, with only one database to share among them all. If required, attach (affiliate) contacts to company automatically from drop-and-select list of companies. Use to conduct spam-free personalized e-mail marketing at no additional cost. Store e-mail messages in archive and use them as often as possible. Automatically configure outgoing mail server parameters. Automatically test your mail server for readiness. 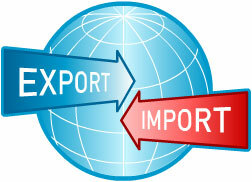 Export data from your database to other office programs - Word, Excel, Html, Text, WordPad etc. OR Directly use data to design labels (including mailing address stickers, envelopes, badges) for printing. Customizable options to march your individual preferences. Experiment with different table colors and sizes, handle inevitable contact information changes without stress. Inexpensive. 4 in 1 software being offered for the price of one. Ready-to-use solutions with detailed help documentation. Free technical support ensures you always have the latest version of the application running on your PC. Flexible licensing - Purchase 1 license and use it for many computers. You can install the software on as many computers as you want, transferring your license to them unlimited number of times. There are no limitations in relation to number of times you can run purchased programs. You buy it - it is yours forever. v3.1.1.89 November, 2014 Major updates. v3.1.1.41 March, 2011 Major updates. Some minor optimizations to search mechanism. EU (12hr, AM/PM, dd.mm.yyyy) date-time format capability added. From the options and settings page (scheduler), user may switch between US and EU formats. v3.1.1.29 April, 2010 Major updates. v3.1.1.27 April, 2010 Major updates. v3.1.1.19 December, 2009 Major updates. Number of file attachments increased from 1 to Unlimited for Multi-User version. For Single-user version the maximum attachments remains unchanged, i.e. 1.
v3.1.1.9 December, 2009 Major updates. v3.0.1.1 September, 2009 Major Updates and Fixes. v3.0.0.89 September, 2009 Major updates. v3.0.0.87 August, 2009 Major updates. Some serious bugs in the contacts data entry form fixed. This section used to freeze due to error in the cross-links between the master contacts table and corresponding lookup tables. Database re-structured, synchronized and optimized in preparation for multi-user version to be released in the nearest future. Sections cross-link extension. Daily, weekly, monthly tasks can now be automatically assigned and linked to contacts or companies in the database. 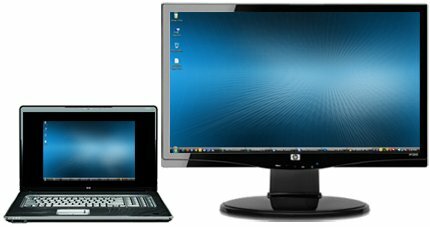 Desktop/Laptop version of Business Kit is suitable for personal, home, small and medium business. Before you decide on purchasing the software, however, we strongly recommend that you download the free trial version to be certain it meets your needs and expectations. Business Kit has been Designed for Microsoft Windows� Operating System. To start your free trial, click the Download Now! button below. The installer will automatically create the necessary folder for Business Kit under default directory. Of course, before or during installation, you will be prompted to confirm installation into the default or choose any other directory on your computer. For example, C:\My Programs. Browse to choose the necessary folder if you do not want to install Business Kit under default directory. Using your file manager, open the folder where you have downloaded the installation file. Follow the installation instructions. The installation wizard will guide you through the installation process. In many cases, rebooting after installation is not necessary. However, the installer may update some Windows system components, which will require you to reboot at the end of the installation. In addition, if you are installing on Windows 95/98 or Windows Me, you may wish to reboot to have your PATH environment updated. All files replaced during installation are copied and saved into backup folder on your computer. If the downloaded installation file is corrupted you should delete it from your hard drive and try to download it again. If you are still not able to install downloaded product please contact us and will assist as soon as possible. During installation, many files are transfered to your computer and certain records in your system registry are updated. De-installtion is the reverse process of installation. It entails removing the files and records affected during installation, updating the registry to previous state before installation. When un-installing, the Installation Wizard will automatically handle all necessary processes. Therefore, to un-unstall DO NOT JUST DELETE THE PROGRAM FILE(S)THE WAY YOU WOULD A NORMAL FILE. Double-click on the Add/Remove/Uninstall Programs icon. A new dialog box opens showing a list of all installed applications. Again, DO NOT JUST DELETE THE PROGRAM FILE(S) THE WAY YOU WOULD A NORMAL FILE. Use the uninstallation wizard as described above. Purchasing Business Kit is as simple as A-B-C. Because your online shopping security and comfort is most vital to us, we have hand-picked and partnered with FastSpring, a reputable e-commerce services company that specializes in Secure Order Processing, in whom we have absolute confidence. When you click the Buy Now button, you will be taken to our Secure Payment Gateway to finalize your order. FastSpring will handle all the billing and payment processing. Our Online ordering process is 100% secure and safe. All data exchange during payment process goes through Secure Socket Layer(SSL) encryption. Secure Socket Layer (SSL) encryption is used for every transaction in order to ensure that your online order and payment information is secure. Software License activation/Registration takes less than 5 minutes after payment. A license key lasts indefinitely. Once again, we would like to re-assure you that the online ordering process is 100% secure. Orders placed online are processed more quickly than those submitted by fax or email. However, if you encounter any problem ordering online or you simply prefer to place your order by fax, e-mail, or phone, please use the information below. Santa Barbara, CA 93101, US. If you feel using desktop/laptop/off-line software is no longer efficient, then we have a solution for you. The web-based (online) version of Contact Manager may be exactly what you need. You can use the software Hosted on our server or Install it on your server. 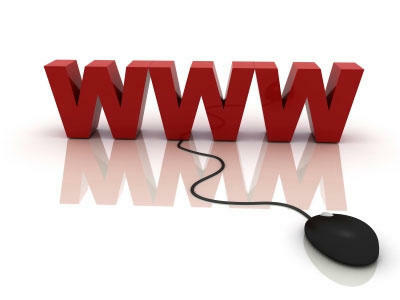 Web-based/online software works on any platform with a web browser and internet connection. Mac, Windows, Linux are all supported. You do not have to install any CDs, download any software, or worry about upgrades. You no longer need to worry about hardware, networking or maintaining physical systems. All your data is centralized and accessible over the web from any computer at any time. You can work from home, work, or on the road. When you use web-based software your office is everywhere : At work, at home, a hotel, at a client's office, even on your mobile phone. Your data is accessible anywhere with internet access. Software products can be updated automatically via our server without you even noticing it. Most of the features in Business Kit are customizable. You can perfectly adapt the software look and behavior to your taste, modifying its alarm sounds, the look, colors of most elements, pop-up reminder windows to match your individual preferences.